We have reached the state quarterfinals in the 11-Man classes of Kansas high school football, and the 8-Man classes will play the semifinals this week. Kpreps will continue to post state rankings throughout the playoffs culminating in our final poll after the state champions are crowned. Let’s take a look at the Kpreps.com rankings for November 9th. Check out our complete Rankings for further details. There are no changes in this week’s Class 6A poll as all five teams advanced to the final eight. Top-ranked Lawrence outscored Shawnee Mission North 56-32 to advance to a date with Blue Valley on Friday. Shawnee Mission East extended its playoff streak to five straight with a 49-13 win over Blue Valley Northwest. Wichita Northwest cruised over one-win Wichita North 55-13, while No. 4 Derby had little trouble with Topeka High. Finally, No. 5 Olathe North shut out Blue Valley North in the second half to advance with a 35-28 win. The Eagles will host No.2 Shawnee Mission East this week in a rematch of 2014’s classic semifinal match-up won by the Lancers, 36-35 in double overtime. In Class 5A, No. 1 Mill Valley advanced to a quarterfinal showdown with No. 5 Pittsburg as both schools posted 49-0 shutouts in the opening round. Bishop Carroll remains at No. 2 after defeating Salina South 31-14. The Eagles will travel to Wichita Heights this week. St. Thomas Aquinas remains ranked third this week after a big win over Topeka Seaman. The Saints will take on No. 4 St. James Academy which picked up its first-ever playoff win, 41-20 over Lansing. Buhler remains the only unbeaten team in Class 4A-I, but the Crusaders got tested by Mulvane for a second time this season. Buhler will travel to No. 3 Topeka Hayden in this week’s quarterfinal. The other quarterfinal matchup featuring ranked teams has No. 1 Bishop Miege hosting No. 4 Paola. The only change to the top five this week has Abilene replacing Ulysses at No. 5 after the Cowboys scored twice in the fourth quarter to top the Tigers, 43-38. There are no changes in this week’s Class 4A-II poll. Columbus remains atop the poll after a 55-7 win over Anderson County, while No. 2 Andale got a scare from Nickerson but advanced, 60-45. Holcomb was impressive in a 48-0 shutout of Concordia, while No. 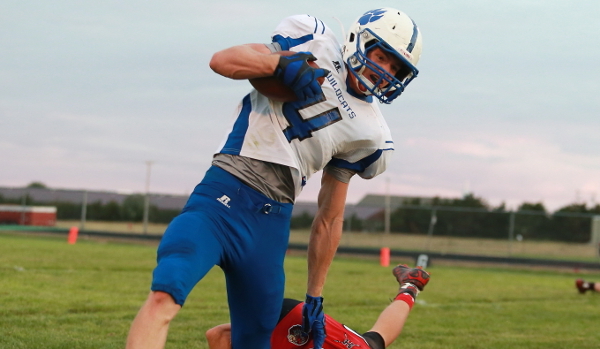 4 Holton eliminated Osawatomie for a second straight season. The Wildcats will travel to No. 5 Frontenac in the quarterfinal round this week. The top five in Class 3A had consisted of the same five teams all season, but a pair of “upsets” in Saturday second-round action changed that. Last week’s No. 3 Scott City and No. 5 Silver Lake were both eliminated over the weekend. While the top of the poll remains the same with No. 1 Rossville and No. 2 Wichita Collegiate, Halstead moves up a spot to No. 3. Hoisington and Norton enter the poll at No. 4 and No. 5, respectively. The Cardinals blasted Cimarron and Washington County last week and remain unbeaten on the season. Norton scored with 16 seconds left to knock out Scott City 28-24. Sabetha took advantage of six Silver Lake turnovers to beat the Eagles, 34-28. In Class 2-1A, Sedgwick dropped its first game of the season 48-21 to Smith Center in the first round of the playoffs. The Cardinals drop from No. 2 out of the top five, while Smith Center moves up one spot to No. 3 this week. Meade remains atop the poll and will host No. 2 Phillipsburg in this week’s quarterfinal. Troy moves up one spot to No. 4 this week, while defending champions Olpe enters the poll at No. 5. Top-ranked Spearville won the most anticipated 8-Man game of the year 58-28 over defending champion Central Plains. The Royal Lancers will travel to No. 5 Solomon this week with the winner going to the state championship. Central Plains drops from No. 2 to No. 4 with the loss. Hanover moves up to No. 2 this week after wins over Rural Vista and West Elk. Wildcat quarterback Will Bruna broke the single-season state record for passing yards in the win over West Elk. Bruna has now thrown for 3,010 yards and 51 touchdowns, breaking the mark of 2,837 yards set by White City’s Michael Hammersmith in 2000. Bruna’s 51 touchdown passes this season is one short of the state mark of 52 set by Central Burden’s Bo Savage in 2010. He’ll have a shot at that record as the Wildcats take on No. 3 Burlingame in this week’s other semifinal matchup. It was an emotional week in Kansas high school football as Sharon Springs-Wallace County all-state player Luke Schemm died after collapsing on the field during the Wildcats 65-20 win over Otis-Bison on Tuesday. With seemingly the entire state sharing condolences, prayers, and support, the second-ranked Wildcats returned to the field on Saturday to outscore No. 5 Ingalls, 74-58. Wallace County will host No. 1 Victoria in one of this week’s semifinal games. The other semifinal features a rematch of 2014 with No. 4 Axtell taking on No. 3 Argonia-Attica. The Titans won last year’s game 70-44 over Axtell finished as the state runner-up.